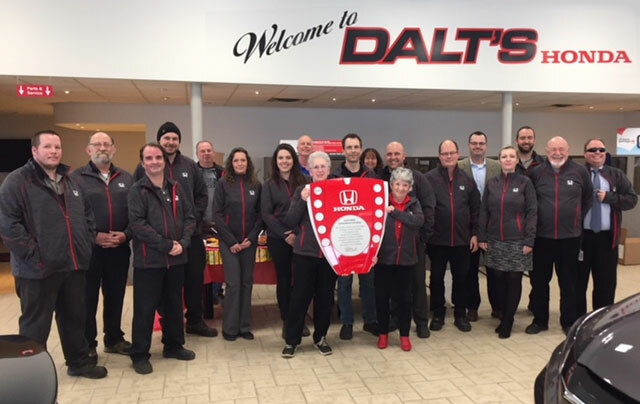 We are extremely proud to announce that Dalt’s Honda is a Honda Driving Excellence Dealer. Designated by Honda Canada, this is based on delivering an exceptional customer experience as a dealership determined by customer feedback to Honda Canada. Our dealership not only awarded this prestigious honor, but we are also 1 of 2 Ontario Honda dealers (1 of 10 across Canada) that are recognized as part of the High Achievers Club, by achieving the highest score Vs. other dealers in our grouping. A big thank you to our staff and all our customers for being part of the Dalt's family. We will continue to strive for excellence.